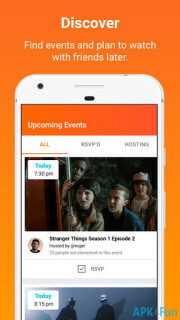 Never count down and press play again: Rabbit makes it simple to sync up anything you&rsquo;re doing online, from catching up on your favorite shows with friends to playing games and listening to music. The possibilities are endless: Anything you can do in a browser, you can do in Rabbit. &bull; Join other people's room and watch TV and movies together! &bull; Host your own live room and let anyone on Rabbit join you. Questions? Requests? Just want to say hi? TeleMe - Phone Calls ..